You want to decorate menu, design pictorial illustration for the cooking article in the fashionable magazine, create attractive posters for your cafe or restaurant, or develop beautiful advertising materials? In order to ideally cope with all these tasks, use the easy recipes design software - ConceptDraw DIAGRAM extended with Cooking Recipes solution from the Food and Beverage area of ConceptDraw Solution Park. First of all, pay please your attention for the collection of libraries offered by Cooking Recipes Solution. It is 14 libraries with incredibly large quantity of ready-to-use objects - 565 professionally designed vector objects of foods - fish, meat, vegetables, bread, spices, drinks, delicious dishes - salads, soups, seafood, desserts, kitchen ware and cooking appliances, and many others. 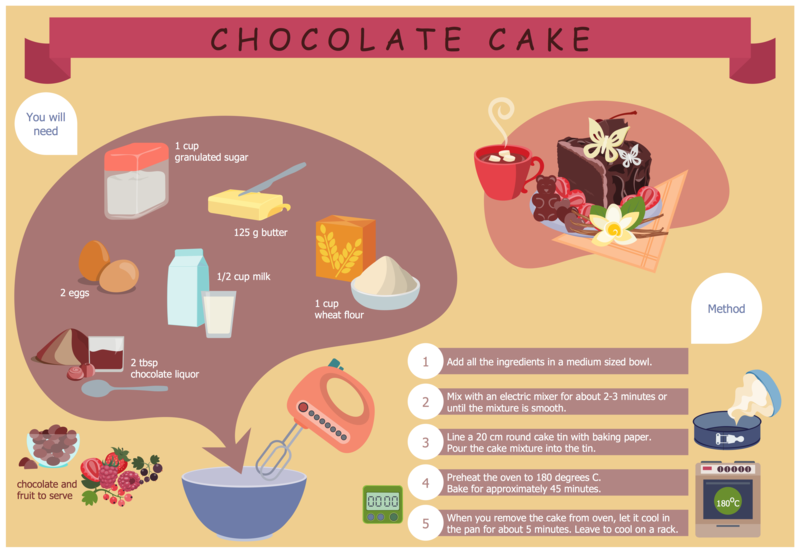 Cooking Recipes Solution offers also collection of predesigned examples and samples of beautifully illustrated easy recipes. All they are represented at your disposal in Cooking Recipes section of ConceptDraw STORE. 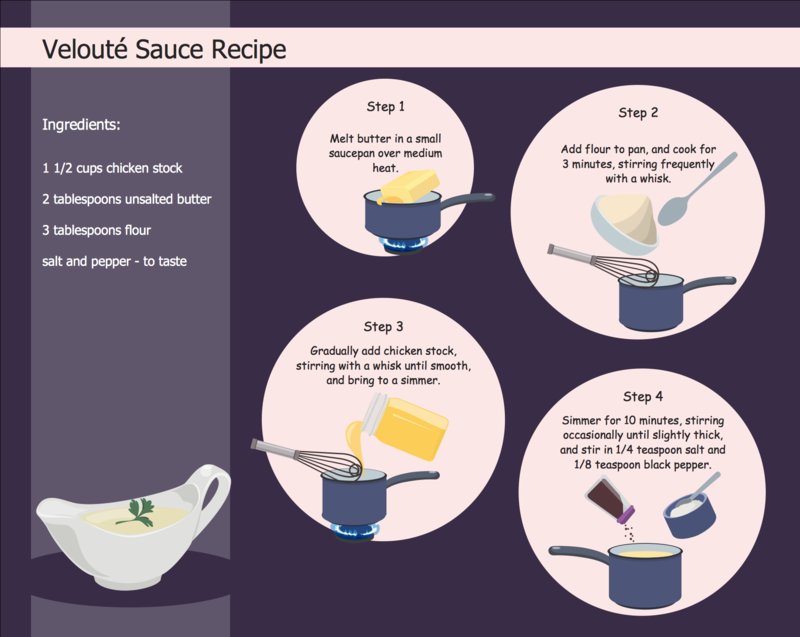 The samples you see on this page were created in ConceptDraw DIAGRAM software using the Cooking Recipes Solution and demonstrate the illustrations of cooking recipes. An experienced user spent 15 minutes creating each of these samples. Use the powerful drawing tools and vector objects from the numerous libraries of the Cooking Recipes Solution for fast and easy recipes design. All source documents are vector graphic documents. They are available for reviewing, modifying, or converting to a variety of formats (PDF file, MS PowerPoint, MS Visio, and many other graphic formats) from the ConceptDraw STORE. 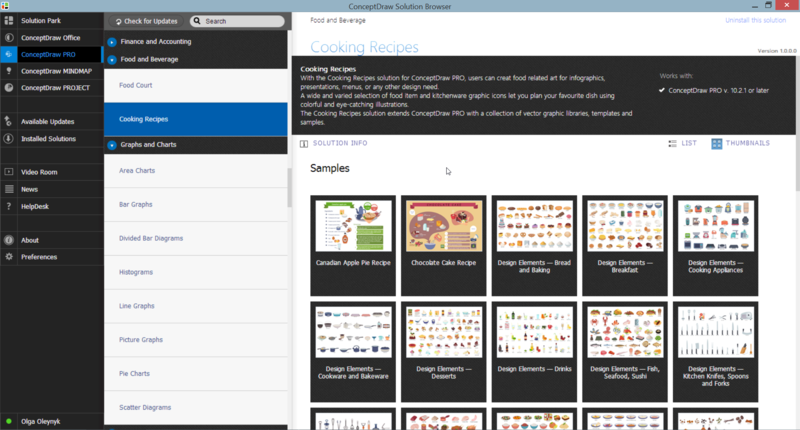 The Cooking Recipes Solution is available for all ConceptDraw DIAGRAM users. Pictures of Food represented on the food court signboards, show-cases, at the menus form the cafe style and attract clients. Bright, colorful and effective advertising increases the chance of visiting exactly this cafe among many in the food court. When visiting fast food at the food court, a potential client is enough to throw just a glance at the menu-board. ConceptDraw DIAGRAM v12 software offers the Food Court solution from the Food and Beverage area of ConceptDraw Solution Park for easy designing unique pictures of food. The food has great importance in human life, but it is very important that the food was tasty and salubrious. Preparing the food with help of different recipes from the fashion magazines, popular cookbooks, Internet cooking sites, we firstly pay attention to the recipe's design, how delicious and aesthetically the dish is presented on the picture. Use the ConceptDraw DIAGRAM v12 diagramming and vector drawing software extended with Cooking Recipes solution from the Food and Beverage area of ConceptDraw Solution Park for easy design colorful and eye-catching food recipes illustrations. Holiday recipes are always recipes of amazingly delicious and beautiful dishes that delight by decoration and miraculous combination of ingredients, and remain long in the memory. Design of illustrations for recipes of holiday dishes for cookbooks, magazines and websites is a special art, because one of the main criteria for selection the recipe and its next cooking is colorful and appetizing illustration. ConceptDraw DIAGRAM v12 diagramming and vector drawing software extended with powerful tools of Cooking Recipes solution from the Food and Beverage area of ConceptDraw Solution Park will help easy create colorful, bright, attractive and appetizing illustrations on preparation and decoration holiday dishes. Designing of food images, fruit art illustrations, pictures of vegetables, and many other food and cafe related images and infographics has never been easier than it is now with ConceptDraw DIAGRAM v12 software. ConceptDraw DIAGRAM v12 diagramming and vector drawing software extended with Food Court solution from the Food and Beverage area of ConceptDraw Solution Park is perfect food pictures design software.